Advisory Flood Height The water surface elevation (WSEL), in feet, of the 1% annual chance (100-year) flood at a given location, as determined using hydrology and hydraulics (H&H) analysis and the best available elevation data. Add 5 feet to this value to allow for accuracy issues. This information is currently available for approximately 12% of the West Virginia counties. Cross Section (XS) Line Representation of the location of channel surveys executed in order to provide input to them hydraulic model used to calculate flood elevations. These locations are also shown on the flood profiles found Flood Insurance Study (FIS) reports. Detailed Study An engineering study that results in the delineation of floodplain boundaries for the 1-percent-annual-chance flood, and also includes the determination of BFEs or base flood depths. Flood Hazard The physical phenomenon of high water associated with, for example, a stream, water body, shoreline or area of ponding, and the likelihood of its occurrence. Hazard = Source of Danger. Flood Risk The people or property potentially effected by, high waters associated with, for example, a stream, waterbody, shoreline or area of ponding. This risk is typically expressed as an estimated loss. Parcel A lot, plot or tract of land, owned by a person, business, or municipality. 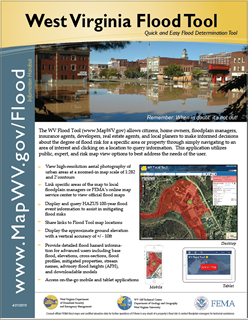 Preliminary DFIRM A community flood mapping database (DFIRM) that has been completed by the mapping partner/contractor, submitted to FEMA for validation, validated and releasted to the community for review by local stakeholders. Preliminary DFIRM data may be used for planning purposes in regulating development in 1% annual chance floodplain areas but do not replace the current FIRM or DFIRM until the Preliminary becomes Effective. Supported by all modern browsers: Please contact Eric Hopkins with questions or comments relating to the site. Copyright 2015.